As I reflect on 2016 and all it was and all that happened it seems to me, like most other years in my life, I journeyed along the road less travelled. There were definitely a few pot holes along the way this year! Robert Frost’s famous poem, The Road Not Taken, has always resonated for me. And while my life is not one of extremes or outrageous achievement or adventure, it has not followed the path most expected. And for that I’m truly happy. It’s led me to visit places I might not have otherwise, to meet people whose path I would not have crossed and to take me from my comfort zone to exciting new experiences. I don’t pretend that people understand my choices and sometimes the path has become a narrow, challenging track. But it’s all been worth it. Twenty sixteen was ushered in with good friends and ushered out in the same way –both occasions surrounded by people from around the globe all wishing the best for each other. The year (2016) dawned bright and sunny and soon shrouded us in Cambodian dust and smoke and noise. It was a year filled with new places and wonderful acquaintances, cultural experiences and grounding ideas. But the year was tinged with sadness. The loss of loved ones — my uncle, the Joker’s granny and our dear neighbour, Reena, who I’ll always remember for her cheerful “you hoo”, her bird-like chatter and her big fluffy slippers. Yes, it was definitely a year of personal sadness. But the silver lining to the dark cloud was the unexpected time we each spent with our respective families. I spent time with my family in England – including relatives I hadn’t seen for 25 years or more. And yet, it was just like we’d never been apart. I was embraced by their warmth and support, love and care. I fit. And I once again found another home. Of course, there was also the bitter cold, but we’ll refrain from mentioning that – it’s a shock to the system we’d rather forget. The Joker reminisced with his family and extended family back in Australia – many relatives he had not seen for many years. They are loud and raucous with big laughs and sharp wit. And they’re always there when needed – with a laugh, a joke, supportive words or a sharp prod. They shared their memories and their stories as only families can. In times of sadness you draw strength from these relationships. Sometimes you need to be surrounded by home and the familiar and the people you know and love. 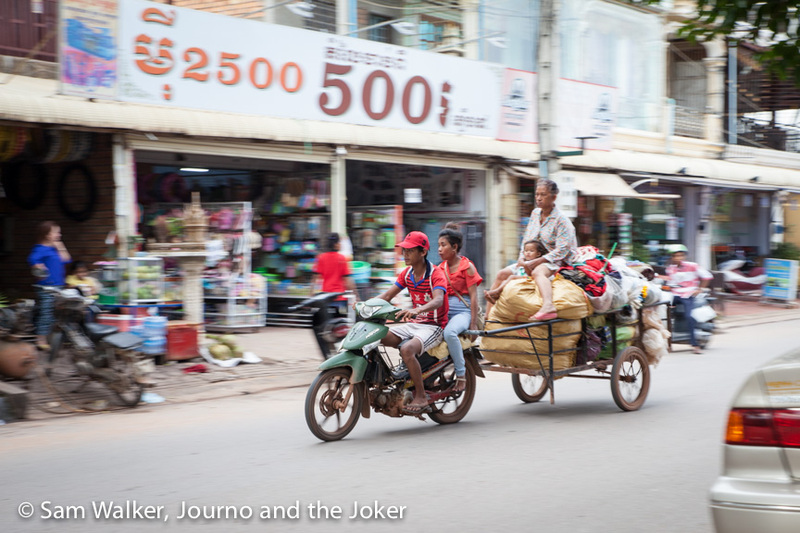 But, people just keep coming back to Cambodia, and so it was for us. Another year in this beautiful country, embracing the crazy and the challenging — and yet the madness all seems so normal. The country and all its quirks has seeped under the skin, it’s got into all the cracks and settled deep. The people have worked their way into our hearts with their big smiles, their humour and their good natures. The place has given us much. 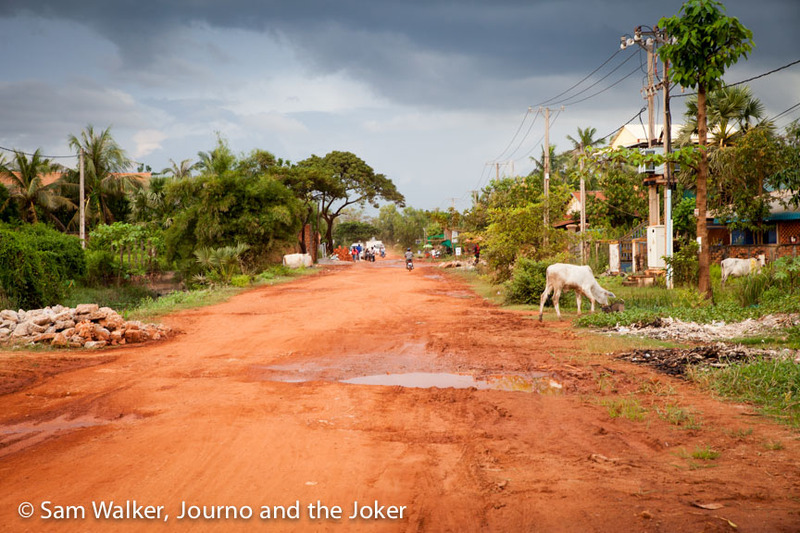 Like the year before it, 2017 dawned bright and sunny in Siem Reap – a little dusty and with the noise of Cambodia rattling and rumbling around – construction workers hammering and grinding, concrete being poured and the squeak, squeak of the recyclers going down the street. A new day, a new year and it is business as usual. But it has awoken with uncertainty. Our future is blowing in the wind. We, like others, have options and choices and we are looking forward to what will be and what we can make of life. We are looking for change and we don’t want to get caught back up in a daily rut — the path previously trodden. Wherever the year leads, I will once again be taking the road less travelled and I look forward to the adventures it will bring. It will surely make all the difference. So soou sdey chnum thmei (happy new year!). May your adventures for 2017 lead you down a road less travelled and to adventures you may not have otherwise taken. On that note I’m going to leave you with Robert Frost’s poem. I love that poem too, it’s been a while since I last read it but think I’ll print it out and hang it up this time. It takes courage to tread the path less travelled. All the best for the new year. Thanks Nina. Yes, it is a while since I read it in full as well. Cool idea to print it out. Hope your 2017 journey takes you down some less travelled paths as well.